Ah yes. Now here is a game that has been lost in history. 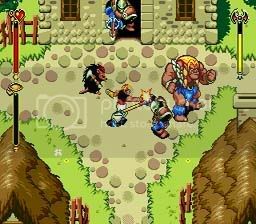 Beyond Oasis was Sega's top down action rpg that was in the same vein as The legend of Zelda franchise. Except Beyond Oasis was able to stand up the the Zelda franchise in many ways. 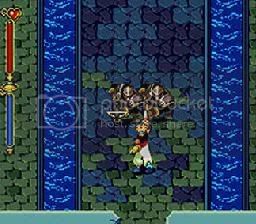 In fact in many ways I like Beyond Oasis a lot more than Zelda: A link to the Past. Beyond was about a boy who went on an excavation and found a lost golden armlet. When he put it on a ghost of the former wearer appeared before him and told him that an evil man has found the silver armlet and is doing evil things. Thus your quest begins. Kind of linear is your ask me. The game doesn't hold you hand though like most action RPG's have done in the past. But even if you are lost and can't figure out where to go ther is a map available to you that shows a flag of where your destination is. Aside from the simplistic story I really enjoyed the game's graphics and sounds. The graphics are superb and to this day still look great. Everything is very well animated and looks lively. Enemies have tons of animation ranging from climbing out of the ground to the summon Efret's Blast blast attack. The ambient sound effects of the game are quite good as well. I would have never expected there to be almost realistic fire sound effects in the game or hearing towns people scream as they run from monsters. 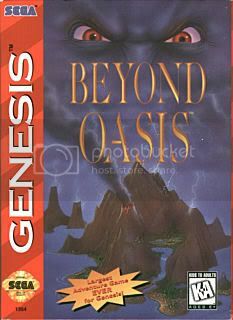 Beyond Oasis also had fun and addicting gameplay. You had a variety of weapons (with limited number of uses by the way), 4 summons (each with seperate abilities) and secret powerful attacks. Oh and you can jump unlike Zelda LTTP. The other elements of Oasis' gameplay consisted not only killing dosens of zombies, giants and weird looking rat things, but awesome puzzles and hidden secrets throughout the entire game. Of course the game is rather short. It is quite possible to beat the game in under 8 hours and there really isn't much to go back and look for once your beat it. This is where Zelda LTTP one ups Oasis. But in the amount of time it takes to beat the game you'll still have a ball playing the game. Also there was a sequel produced for the Sega Saturn, titled Legend of Oasis. Boasting a much better storyline, better sounds effects and music and better graphics and animation it surpassed the original in everyway. If you were to go looking for the game it will cost you close to $40 to acquire it on ebay. In fact you'll roughly pay almost $30 for Beyond Oasis as well. But regardless of the price and availability of the game, it is still a gem and worthy of recognition in this piece. I stil own the game today as a matter of fact and still enjoy it to this day. It pretty much covers computer center related issues.